Eleven individuals have been arrested for suspected involvement in an illegal gambling business. Authorities busted the underground establishment that was located in the Bidipeth area. The raid resulted in the seizure of multiple items worth Rs 8.11 lakh, in addition to Rs 3.61 lakh in cash. Police seized several weapons, including a firearm and a sword. Approximately 50 police officers participated in the three-hour operation. Nagpur authorities believe that it’s one of the most important gambling raids in the last couple of years. 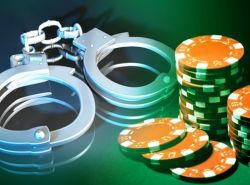 Police decided to raid the premises after receiving information about possible illegal gambling at that location. The raid was a joint operation conducted by three police teams. Besides cash and weapons, police recovered cell phones, two vehicles, plus alcoholic beverages. All suspects were gambling at the time of the raid, and they face gambling-related charges. Police officers used three-wheelers to reach the location in order to surprise the culprits. A spokesperson revealed that both the sword and the firearm turned out to be fake, and therefore not illegal. There are currently no related articles for this article.